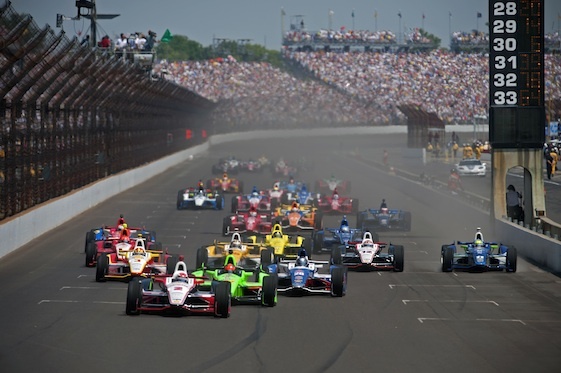 Television coverage of the Indianapolis 500 _ the world’s largest, single-day sporting event _ will move to the NBC network in May 2019 after an historic, 54-year run on ABC as part of a media rights package announced Wednesday between the Verizon IndyCar Series and NBC Sports Group. Sanctioning body INDYCAR is looking to increase exposure for North America’s premier open-wheel series via a multi-year deal showcasing eight IndyCar Series races, including the 103rd running of the Indy 500 on May 26, 2019 and qualifications, on NBC next year. The new package is an increase from five races scheduled in 2018 on the ABC network. Financial terms were not disclosed. ABC began televising “The Greatest Spectacle in Racing” in 1965 and will broadcast the 200-lap event from the famed 2.5-mile Indianapolis Motor Speedway for the 54th consecutive year on Sunday, May 27. It is the longest consecutive relationship between a major sporting event and a broadcast network in American history. “The Indy 500 on ABC has been a Memorial Day weekend tradition for millions of viewers across several generations,” IMS President J. Douglas Boles said in a statement. “Together with ABC, we’ve shared many special and unforgettable moments with our fans across the globe. We’re grateful for the partnership and look forward to concluding it in fitting fashion with this May’s 102nd running. The remainder of next year’s IndyCar Series races will be carried on NBC Sports Network, which has seen its average viewership of INDYCAR races increase by 78 percent over the past four years. Dates, times and networks for next season will be announced at a later date. The 2018 schedule features 17 races on a mixture of ovals, natural-terrain and street courses. In another first for INDYCAR, an extensive amount of IndyCar Series content will be provided through NBC Sports Gold, a leading direct-to-consumer product. Subscribers will be able to choose the content they view and how and when they access it. Either at home or at the track, the service will provide feeds not available on any other platform, including practice and qualifying sessions not televised live. Fans also will be able to watch Indy Lights presented by Cooper Tires races and programming such as INDYCAR’s postseason championship celebration, the traditional Friday-before-the 500 Miller Lite Carb Day at Indianapolis Motor Speedway and additional ancillary programming. Miles also addressed the long and symbiotic relationship between ABC and the Indy 500, which since 1965 has been conducted under sanctioning by the United States Auto Club, Championship Auto Racing Teams, the Indy Racing League and INDYCAR. As part of the new alignment, the Indianapolis 500 will be included in NBC Sports’ “Championship Season” marketing campaign, touting numerous high-profile championship events presented on NBC Sports platforms from May to July. Other events include horse racing’s Triple Crown, The PLAYERS, Premier League Championship Sunday, grand slam tennis’ French Open, the NHL Stanley Cup Final, the Tour de France and The Open Championship. The entire IndyCar Series will receive unprecedented marketing and promotional support from NBC Sports, which will utilize not only its own assets but also many NBCUniversal assets as well. Texas Motor Speedway President Eddie Gossage, whose track in Fort Worth has hosted a June, Saturday night race since its inaugural season in 1997, applauded the impending deal. “It’s great momentum,” Gossage said during a media event with NASCAR Cup Series driver Daniel Suarez at the Dallas Consulate de Mexico. “INDYCAR continues to grow and that’s a great thing _ the fans know to look to NBC for their Indy car fix. Whether it’s NBC television network or NBCSN or even NBC Gold for practice and qualifying, it’s a wonderful thing. “In 1982, and this is from memory, CART signed with NBC and it really put them over the top to have a 15-year run of success. So this is a great move by INDYCAR, just a continuation of the momentum _ the roll _ that they’ve been on for a while now.” TMS’ 1.5-mile oval will play host to the DXC Technology 600, dubbed “America’s Original Nighttime IndyCar Race,” on June 9. Securing this media rights package figures to continue INDYCAR’s recent momentum. Television ratings have increased 38 percent over the past four seasons and overall media impressions more than doubled in 2017. INDYCAR’s social platforms gained more than 400,000 new followers last year alone. INDYCAR markets its product as the most competitive form of racing on the planet, with 21 drivers winning races over the past six seasons. Last September, Josef Newgarden of Team Penske, then 26, became the youngest series champion in more than a decade and first U.S.-born champ since 2012. Earlier this month INDYCAR officially debuted its new-for-2018 universal aerodynamic Dallara chassis powered by either Chevrolet or Honda twin-turbocharged V-6 engines at the season-opening street race in St. Petersburg, Fla. The event, won by four-time Indy car champion Sebastien Bourdais of Dale Coyne Racing with Vasser-Sullivan, produced a record number of passes around the 1.8-mile temporary circuit. The addition of four new teams reflects the series’ growth. One of the largest fields in recent history is expected to attempt to qualify for the traditional 33-car field for the 102nd Indy 500 this Month of May. NBCSN, a telecast partner with INDYCAR since 2009, will air its first IndyCar Series race of the 2018 season on Saturday, April 7, at the 1-mile ISM Raceway near Phoenix (9 p.m. EDT). INDYCAR is the governing body of the Verizon IndyCar Series; the Mazda Road to Indy presented by Cooper Tires development ladder, which includes Indy Lights presented by Cooper Tires; the Pro Mazda Championship presented by Cooper Tires and the Cooper Tires USF2000 Championship powered by Mazda and the Battery Tender Global MX-5 Cup presented by BF Goodrich Tires. When the Comcast-NBCUniversal transaction was completed in January 2011, sports assets of the two companies combined to form NBC Sports Group, serving fans 24/7 with premier live events, studio shows and original programming. The sports media company consists of NBC Sports, NBC Olympics, NBCSN, Golf Channel, NBC Sports Regional Networks, NBC Sports Radio and NBC Sports Digital, which includes NBCSports.com, NBCOlympics.com, GolfChannel.com, the digital assets of the NBC Sports Regional Networks, Rotoworld, the NBC Sports Talk franchise, multiple apps and two transactional sports businesses, GolfNow and SportsEngine. NBC Sports Group possesses a wide-ranging collection of TV rights agreements, partnering with INDYCAR, NASCAR, the International Olympic Committee and United States Olympic Committee, the NFL, NHL, PGA TOUR, The R&A, PGA of America, Churchill Downs, Premier League, Rugby World Cup, Six Nations Championship, Tour de France, French Open and many more.